At many times in our daily lives we make changes or adapt to changes that were made for us. Whether it is in the work place, our homes or even in the world of drum corps, we all hope that these changes will succeed. Such is the case with Atlanta CV, the quiet giant from the South in the land of DCA. In 1998, when the group was first on the field, the CorpsVets name was chosen as a way to really demonstrate who they were and what they were all about. The first group was almost exclusively made up of veterans of DCI and DCA corps from the previous few decades as a “Senior Corps “. As time went on, the concept of “Senior Corps” was no longer used and the corps really embraced the “all-age” approach and had an increasing percentage of younger members. As preparations were made for the 2012 season, the board and other key advisors had many discussions about the corps and how it had evolved and continued to do so. They focused on “who their target was” as far as recruiting new members and found that a large majority of their members had never marched in a corps before. Quite a few of them saw this DCA experience as a key stepping stone to DCI, plus people were under the assumption that you had to be a veteran of a drum corps to even apply. The board and advisors believed strongly that they were missing out or not connecting with a significant group of potential members. Over the years it was quite common for all involved to use “CV” as a nickname. In 2010, when their uniforms were redesigned, the CV logo was added on one of the shoulders of the jackets. Realizing they had to re-brand and to dispel any impressions that they were still a “Senior Corps”, they decided a name change was essential. But with nearly fifteen years of history, they did not want to abandon the brand that had already been built; that is how they became “Atlanta CV “. They were able to move into a more contemporary and sleek look and feel, without losing the heritage. The change seems to have been a great success: their recruiting, fan base, and marketing presence has grown quite a bit in that time. The only problem now is making sure their older fans and supporters and occasional stadium announcers remember the name change. Percussion Caption Head Chris Romanowski had a vision and a dream to start an indoor percussion unit. 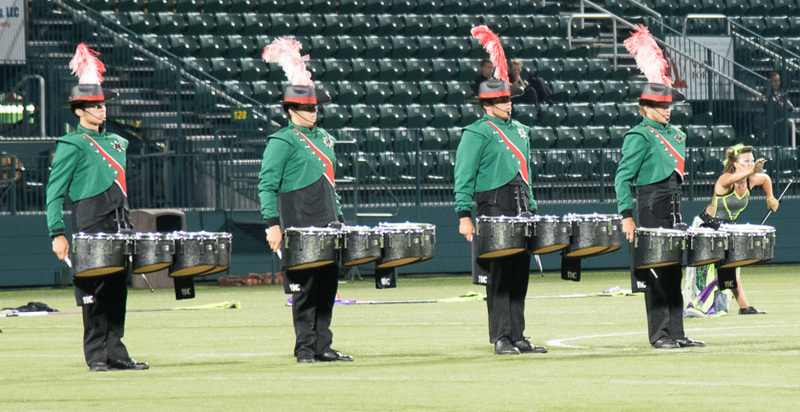 The percussion section has been a huge area of growth over the past few seasons and at one point about fifty individuals auditioned for eight snare drum spots! So with so many talented and deserving individuals trying out, there just was not enough spots available. The Atlanta area once had several Independent indoor percussion groups competing at the top level but many had gone inactive. So, at Chris’ urging, the Board of Directors decided to open up an indoor percussion line to debut in the 2015 season. 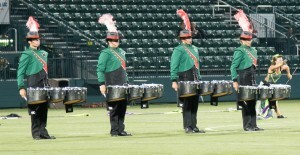 This turned out to be a whirlwind and the group was entered into Percussion Independent World Class. Things really took off as tons of talented players came in from all around the Southeast with a very dedicated group of instructors and staff to bring it to life. By the time the group was competing in WGI Regionals in mid-season, it was pretty impressive that a group that didn’t even exist in October was out on the floor holding their own against some of the best of the best. One of the main goals of having a high level indoor line is to use it as a springboard for the outdoor season as a decent number of them will be in the corps this summer. Any first year group has ups and downs and the goal now is to learn from the first year and to keep getting better and better. Atlanta CV has one Charter Member who has never missed a season on the field since 1998 which makes it eighteen consecutive years of drum corps marching! That is Rob Scott who serves as mellophone section leader and frequent soloist. Executive Director Dr. David Stollberg, Drum Major Marvin Fontaine, board director Ken Huff, Treasurer Tammi Stollberg, board director and contra player Mark Justice, Assistant Director Brad Hood and a few others have also been involved with the corps since the beginning or nearly that. Drum Major Dan Detweiler will share the field in 2015 with his son Tristan who is a tuba player and college student. Dan is a band director in the Atlanta area and a former Blue Devil from the 1980’s while Tristan is hoping to land a starting spot in the Blue Devil’s line in a future summer. Seeing his son follow in his footsteps would make Dan one very proud father. Benny Schmidt comes to Atlanta CV in 2015 from Germany where he was a veteran of Heartliner. When the corps hall and equipment were lost in a fire, he decided to use that as an opportunity to explore options of marching in the U.S. He spoke with several corps but found his new home in Atlanta. When you factor in the huge burden of cost and time to travel to get here, his new family is very proud to have him join their ranks.